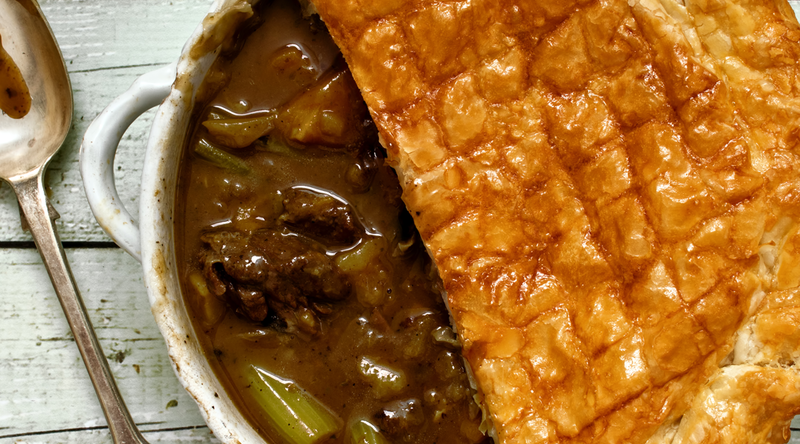 Noel's Steak and Guinness pie never fails to impress. Peel and chop the onions, garlic, carrots, and celery, slice the mushrooms, and pick and finely chop the fresh rosemary. Add the onions and fry gently for about 10 minutes in a heated sauce pan with 1 tsp of oil until softened, stirring occasionally. Turn the heat up, add the garlic, carrots, celery and mushrooms, then mix everything together before stirring in the beef, rosemary, and a pinch of sea salt and 1 level teaspoon of black pepper. Fry fast for 3 or 4 minutes, , stir in the flour, when mixed, pour in the Guinness and add just enough beef stock to cover. Bring to a simmer, cover the pan with a lid and place in the oven for 2½ hours, or until the meat is very tender and the stew is rich, dark and thick, stirring halfway. Meanwhile, roll the pastry out to the thickness of a pound coin. Place the pastry over the top of the pie dish pinching or folding and tucking in the edges to seal, then lightly score the surface with a criss-cross pattern. Beat the egg, then brush over the top of the pie and bake directly on the bottom of the oven for 45 minutes at 160 until the pastry is puffed and golden.